Frontline is finally returning to World of Tanks, kicking off on February 11th. This time Frontline has received a slight revamp making it more enjoyable than ever. It’s a little different from last year, in that 2019’s Frontline will not be a short-term event. Instead, it will consist of a whole series of events throughout the year. So, every calendar month, Frontline will kick off and be available for one week. Read up on new progression mechanic and other important changes coming with your favorite mode! How to Play: Select the corresponding tab in the battle type drop-down list to enter the Frontline queue. Battles take place between two teams, with 30 players on each. Only Tier VIII vehicles are allowed in this mode. To fight in Frontline, players can use any Tier VIII vehicles available in the Garage, as well as special vehicles, that are available for rent. The attackers should break through the defense and destroy at least 3 out of 5 pillboxes on the enemy territory. The defenders should repel enemy attacks until the battle timer elapses. First defense line (zones A, B, and C): starting point for the attacking and defending teams. Second defense line (zones D, E, and F): the frontline is shifted to this map area once at least one zone at the first defense line is captured. The third defense line (not divided into zones) represents the map area, where the final battle takes place. The main objectives are located here—the pillboxes with powerful high-caliber guns. These pillboxes do not rotate or move, the attackers must destroy them to secure victory. In the beginning, the teams are evenly distributed on each front: 10 vehicles per front, at the zones of the first defense line. The map has 5 pillboxes. As soon as attackers capture at least one sector within the 2nd defensive front they can embark on their primary mission and destroy Pillboxes: long-range guns, each with their own HP pool. Pillboxes are protected by armored hoods and virtually impenetrable from head-on. Aim at their rear, where there is significantly thinner armor. The attacking team win as soon as they destroy 3 pillboxes. There are special spots scattered across the active combat area where you can restore HP, repair modules, replenish ammo and consumables. Repair and Resupply Zones have a cooldown time. Once you have repaired your vehicle to 100%, you must wait 120 seconds before you can use it again. If you are hit while in a Repair or Resupply zone, you must wait an additional 5 minutes to stock up on rounds and finish repairing the vehicle. An area on the map where the attacking team can gain control over a particular front. Standard base capture mechanics apply: once the attacking vehicles enter the circle, the front begins being captured. When the attackers capture a base, they take control of the entire zone, and the next zone (vertically) becomes available for capture. Each of the zones in the first and second lines has a base. When the attackers capture a base, they take control of the entire zone, and the next zone (vertically) becomes available for capture. E.g. after capturing a base in zone A, the attacking team is able to capture zone D.
If at least one zone of the second line is captured, the third line becomes available and the attackers can attempt to destroy the main objectives (pillboxes). Base capture points will be reset only after destroying an enemy vehicle that is capturing the base. Causing damage to a vehicle or damaging a vehicle's modules blocks base capture of this enemy vehicle for 5 seconds. The more bases on the first defense line that are captured, fewer points will be required for capturing bases on the second defense line. If the attackers capture one base on the first line, they will have to earn 450 points to capture a base on the second line; two captured bases on the first line reduce the number of required capture points of the second line to 250; all captured bases on the first line reduce the number of required capture points of the second line to 150. Captured zones cannot be retrieved. In case of losing a zone, the defenders need to leave it within 1 minute, after which an air strike is called in at this zone causing significant damage to all defending vehicles there. Respectively, if attacking vehicles get to a zone at the second defense line, while the previous zone has not yet been captured, the vehicles will receive significant damage from an airstrike in a matter of seconds. Once attackers capture at least one zone at the second line, they can destroy the main objectives. Pillbox armor images courtesy of WoT Express. The basic battle duration in the Frontline mode is 12 minutes. This time can be extended through effective actions of the attacking team. Each of the captured zones (A, B, C) adds 2 minutes to the battle timer. Each of the captured zones (D, E, F) adds 2 minutes to the battle timer. 4 minutes are added for capturing the last zone. If the battle time elapses and at least one player of the attacking team remains in the base circle, overtime triggers. The maximum overtime duration is 90 seconds. There is only one period of overtime, after which the defenders will be deemed victorious. Respawns, Resupply Points, as well as Combat Reserves (that can help win even in a desperate situation) will be available in the Frontline mode. At the beginning of each battle, each player has one respawn. Every 5 minutes one more respawn will be added, but you cannot accumulate more than 2. The total number of respawns is not limited. Players will not be able to respawn in zones where 12 other allies are already fighting. 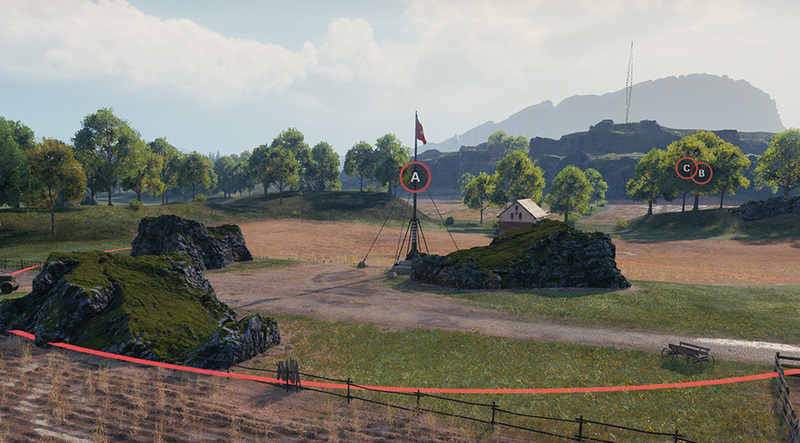 In one zone there can be a maximum of 1 SPG, and if it is already there, then you will not be able to respawn an SPG in this zone. When the player's vehicle is destroyed and there are respawns available, the player will be transferred to the respawn screen, where they can select an appropriate vehicle and a point for spawning within zones controlled by the player's team. We introduced another feature because of the large map size: it allows changing a lane in battle. For example, this feature can be useful when you have destroyed the enemy on a flank and captured the last zone, and now you need to go to another flank quickly to support your allies. When pressing J, the vehicle selection panel will be displayed. This allows you to choose another vehicle and respawn in another flank. In this case, the first vehicle will be self-destroyed after a short countdown, but sometimes such actions may lead to a victory. There will be six Combat Reserves available in the Frontline mode that can be used in battle. Three slots for light tanks and SPGs. Such distribution will help each vehicle type influence the current battle situation: for example, in addition to scouting, light tanks will coordinate their actions with the team by using a large number of Combat Reserves. Combat Reserves can only be selected in the Garage before entering a battle. The Combat Reserve slots are displayed to the left of the standard consumables. Each Combat Reserve has 5 levels. They can be upgraded using the Supply Points received for earning tiers that will be described below. Calls in a bomber that drops 60 bombs to an area of 50 x 30 meters. Vehicles within the strike area receive insignificant damage and get stunned for 26 s. Airstrike is most effective against swift targets and large enemy formations. Players will earn a small amount of experience for causing damage with this Combat Reserve. Players will also earn an additional reward for stunning enemy vehicles. Experience and credits will be added for causing damage using this Combat Reserve. An artillery unit fires 20 shells within 5 seconds and the radius of the area is 10 meters. Vehicles in the center of the artillery strike receive considerable damage; at the same time, vehicles at the edge of the strike are relatively safe. Artillery Strike is most effective against slow targets. Players will earn a small amount of experience for causing damage with this Combat Reserve. Provides a constant 50% bonus to the resupply speed and 50% bonus to the refresh speed of Resupply Points. The attacking team receives a 100% bonus to base capture speed. When causing damage to an attacker, the base capture is paused for another 10 seconds. 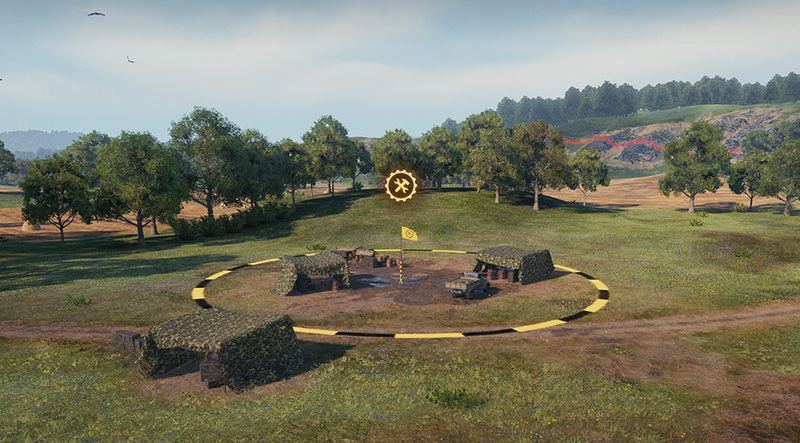 Additionally, the defenders can block base capture by entering the base circle. The Engineering Combat Reserve is most effective for either attacking or defending bases, or frequent use of the Resupply Points. Inspire improves the crew performance of the vehicle and of all allies (15% to the major qualifications) within the radius of 40 meters for 60 seconds. When a vehicle leaves the area, the effect stays active for an additional 10 seconds. Inspire stacks with other crew bonuses, making it most effective in combination with other Premium consumables and equipment (for example, Extra Combat Rations and Improved Ventilation). When allies cause damage under the effect of your Combat Reserve, you will earn additional experience. If several players activate the Combat Reserve at the same time, the first one to do so will receive the bonus. Upon activation, commands a reconnaissance plane to spot a 300м х 750м area. Recon Flight lasts 15 seconds and spots vehicles in the plane's sight that remain visible for 30 seconds. Recon Flight will be most effective when used around a player's vehicle that is not supported by allied scouts. All information about spotted enemies is received only by the player who has activated the Combat Reserve, but transmitted within the Signal Range; the player will earn experience for damage caused by allies to spotted targets. Experience and credits will be added for damage caused to enemy vehicles spotted by the reconnaissance plane. Five smoke grenades are fired into the specified area (200 to 50 meters). The smoke screen lasts 50 seconds; it blocks the view and conceals vehicles within the specified zone. Vehicles within the smoke screen have 2/3 of the View Range value. The Smoke Screen will be most effective for concealing allies from enemy fire or for making a safe spotting position. Players will earn experience when concealed allies cause damage to enemy vehicles. In addition to a base, every zone has a Resupply Point. Resupply Points replenish shells and restore vehicle durability, damaged vehicle modules, and injured crew members. If a player's vehicle receives damage during repair, the process is paused for 5 minutes. Once a vehicle is fully repaired, the Resupply Point becomes unavailable for 3 minutes. At the end of the battle, players will be charged the full cost of the restored durability, but no more than 100% of the vehicle’s durability. a player repairs a vehicle three times, 40% of full vehicle durability each: they will pay for 100% of repair, instead of 120%. It works even if the vehicle has been destroyed in the meantime. Thus, repair over the vehicle's full durability is free of charge. The total cost of replenished shells will be charged. In this case, if the number of spent shells exceeds the ammo rack capacity, the cost will be deducted from the credits earned in battle. Consumables work similarly to Random Battles: they will be deducted if used at least once, irrespective of the total number of uses. NOTE: All rental vehicles are only available for Frontline, it’s impossible to enter Random Battles or another mode using these tanks. To play Frontline, you just need to have at least one Tier VIII Vehicle. However, for a more enjoyable game experience, it’s desirable to have three vehicles or more, since after being destroyed, the tank is unable to respawn for a few minutes. To quickly get back into battle, simply pick another eligible vehicle and roll out! If there are not enough suitable vehicles in your Garage, or you don’t have any Tier VIII tanks at all, you can rent vehicles. Rental tanks will be available for one Episode or for all remaining Episodes at once. All rental tanks are replicas of existing vehicles, with the same characteristics and properties. Three vehicles will be available for rent each Episode. A total of 11 rental vehicles will be available. As a base vehicle for rent, a replica of the researchable Soviet medium T-44 is available. This tank will be available throughout all Episodes and will not be replaced by any other vehicle. The remaining ten vehicles will be replicas of existing Premium tanks. Two rental vehicles will be available in each Episode, and after the fifth Episode, all the rental pairs will be available again. Rental tanks are offered with “virtual” slots and they will remain on your account until you remove them manually. Rental tanks are available even if you already have the original version of the vehicle. So, you may have, for example, two identical tanks on your account – the T-44 and the T-44 FL. It’s impossible to rent the same vehicle twice. For example, there can be only one T34 FL per account. There are no restrictions on the total number of vehicles, so, there can be up to 11 rental tanks on your account. Leasing for one Episode, if you rent a vehicle for the first time. In this case, the tank is available with the Crew. Renewal for one episode, if you have already rented the vehicle and the lease has expired. In this case, the vehicle remains in your Garage and the lease can be extended, it will cost less than its initial rental. This can be done even if this tank is not available for rental in this Episode. For all remaining Episodes. In this case, the tank will be available for all Episodes, and the unit price in terms of a week will be the most profitable. The price decreases with each Episode*. Weekend offer. Two days before the end of the Episode (Saturday and Sunday), in the case of a first lease, the tank is available for rent for the remaining two days, plus the entire next Episode. So, the rental period can be 8 or 9 days. *This option is not available from Episode 6 for the T-44 FL and from Episode 8 for all other vehicles. This offer will be great for those of you who prefer to play a lot on weekends. The T-44 is credited with 75% Crew in the case of a weekly rental and with 100% crew in the case of rental for the entire 2019 Season. Premium vehicles are credited with a free 100% Crew. If necessary, you can move an established or veteran Crew to the rental vehicle. After the expiration of the weekly rental period, the tank will remain in your Garage but becomes unavailable for battle. You can remove a rental tank from your Garage or extend its rent. To do this, right-click on the tank and select the appropriate item from the menu. You can do it also in Depot (right-click on the tank and select the appropriate item). It’s possible to extend the lease of a tank even if it's not available for rental during the current Episode. So, by the Episode 5 you can have all 11 rental vehicles on your account. All the Gold spent on rent will be accumulated in a special fund that can be used to get a discount on the purchase of the original version of any of the leased tanks. It doesn't matter what tanks and for how long you've rented them, all the Gold will be in the fund. The discount will be calculated depending on how much Gold you spent on rent. The more Gold you spend, the greater the discount you get. The discount will only be in Gold. Gold not used to get a discount remains in the fund and may be accumulated further to receive other discounts. In case, the Gold of the fund was not used to get a discount, after the end of the Season it will be lost. *If you want to buy the original variant of the Pz. 58 FL, the Pz. 58 Mutz will be credited to your account. NOTE: The opportunity to activate the discount will not be available immediately, but in one of the following Episodes. However, Gold in the fund will be accumulated immediately. Five simple yet important aspects: the way of earning experience/credits and the way of calculating the cost of repair and shells. Players pay once per destroyed vehicle, irrespective of how many times it was destroyed during a battle. The repair cost will be deducted only once. Players will only pay for consumables and shells that they have used in battle. The main cost is charged only for replenishing shells and consumables when a vehicle is destroyed. Credits are earned according to similar formulas, by analogy with Random Battles. There is a minor difference: considering the long battle duration and the possibility of using a considerable number of vehicles, we introduced adjusting coefficients to prevent players from losing Credits. The mode is interesting and we want players to focus only on the gameplay. Experience is earned by analogy with Random Battles, plus additional coefficients for the achieved ranks. Experience is distributed among all vehicles that participate in a battle depending on the performance on each vehicle. Personal Reserves, Battle Payments reserve, Premium vehicles: all these bonuses are applicable in the Frontline mode. NOTE: We are willing to encourage only fair players who fight to the end irrespective of the current situation in battle. For this reason, the profitability adjustment coefficient will work only for those who stay in battle to the very end. If you leave a battle before it is over: profitability adjustment will be canceled and the cost of all repairs will be charged in full. Players who leave a battle will be given the chance to return to the battle within 5 minutes of quitting. In this case, the profitability reset will not apply. We’ve gathered and carefully reviewed your feedback on disabling friendly fire, after the start of Frontline last year. It clearly demonstrated that you liked our suggestion and its impact on the gameplay. Thus, in the 2019 Season, friendly fire remain disabled in Frontline. As an attacker, earn a total of 100 base capture points or destroy an enemy main objective. As a defender, cause 1,800 damage to vehicles in zone bases or within 150 m of the main objectives. Be the top player with the highest base XP at the end of the battle from both teams and also receive General rank. Awarded to players who caused and assisted the highest amount of damage during a battle (at least 10,000). Awarded to a platoon that destroyed at least 20 enemy vehicles in one battle. Each platoon participant receives this title. This time, Frontline is not a short-term event, but a full-fledged game Season, consisting of 10 Episodes, which will last throughout 2019. Good performance in Frontline will bring you heaps of rewards: Credits, Consumables, Directives, Personal Reserves, Badges and Medals, as well as Bonds and Gold. The most active and skillful players will be rewarded with reward tanks, including a unique Tier IX secret vehicle. In Frontline, there is a Rank system. There are six Ranks, from Private to General. Increasing your Rank depends on how much experience you earn in battle, which stems from the effectiveness of your combat actions. Your main tasks are to seize / retain zones and destroy main objectives. It’s considered the total experience earned by you from all tanks that participated in battle. The more experience you earn, the higher Rank you receive. Ranks are updated right during the battle, so you can easily track your progress. Depending on the Rank received, you get a multiplier to your experience. The experience multiplier is applied after the battle to the total net experience of all tanks in which you rolled into battle. You earn Ranks (from Private to General) during the battle, but at the end of the battle, depending on the Rank you received, you will be credited with the Frontline Experience. Frontline Experience is used to increase your Frontline Tier and your progress in the 2019 Season. There’s a total of 30 Frontline Tiers. Reaching each Tier brings you rewards. Having reached Frontline Tier 30, you have the opportunity to use a special Prestige mechanic. When using this mechanic, you reset your Frontline Tier and Combat Reserve Levels, getting the opportunity to go from Tier 1 to 30 in Frontline again, earning the same rewards in a new cycle. Using the Prestige mechanics, you not only reset your Frontline Tier, but also increase your Prestige Level. There are a total of X Prestige Levels. Achieving each Prestige Level brings you rewards, including Bonds, Gold, Medals and Badges. Access to the Prestige Levels opens gradually, along with Episodes. You have the opportunity to get ahead of the progress by +2 Prestige Levels from the current Episode. For example, in the first Episode, you can reach the third Prestige Level, in the second Episode – the fourth Prestige Level, and so on. So, already in Episode 8, the most active and skillful players will be able to reach Prestige Level X. Such a mechanic will allow you to plan your activity throughout the entire Season. For example, you can catch up with the Prestige progression and skip one or even two Episodes of Frontline to go on an adventure or vacation. It’s also important to note that the progress of Frontline Tier within one Prestige Level is not reset. For example, if in the first Episode you ended up on Frontline Tier 25, then in the second Episode you’ll start from the same point. In addition to basic rewards, each Prestige Level brings you Prestige Points, which can be exchanged for reward tanks. You can exchange Prestige Points accumulated for reaching Prestige Levels for reward tanks. In total there will be 4 reward vehicles. STA-2: A versatile Japanese medium tank. Thanks to its balance between mobility, firepower, and gun depression, the STA-2 is a capable support vehicle. You can also purchase it for gold in-game. WZ-111: A Chinese heavy tank featuring high damage per shot, as well as good mobility and sloped armour. Effective both against heavy and medium tanks. EMIL 1951: This is a Frontline-exclusive vehicle, a unique heavy tank with an autoloader, which is brand-new and exclusive to Frontline. A secret Tier IX tank: Its name, class, nation, characteristics are top secret and will be published later during the season. It can only be obtained when you accumulate the required number of Prestige Points and when reaching Prestige Level X. Detailed information regarding the characteristics of the Emil 1951 and the secret tank will be announced during the Season, in one of the Episodes. Each tank has its own value. The further you progress along the progression, the more alluring a tank you can get. If you already have the STA-2 or WZ-111 on your account, you will not be able to exchange Prestige Points for them. After the end of the Season, the Prestige Points remaining after the exchange for tanks can be exchanged for a small amount of Bonds and Gold. The exchange will only be available if it’s impossible to get any of the reward tanks. NOTE: Choose wisely, as the Prestige Points you will earn can only afford you a maximum of two vehicles! In addition to the rewards for each achieved tier, players will receive special Combat Reserve Points required for upgrading Combat Reserves. Unlike the automatic tier progression, players will need to unlock and upgrade Combat Reserves themselves. In the new Season, the map will be optimized to ensure stable performance. You will see a noticeable increase of FPS on a PC of almost any configuration. However, Frontline will still require more system resources than regular Random Battles. 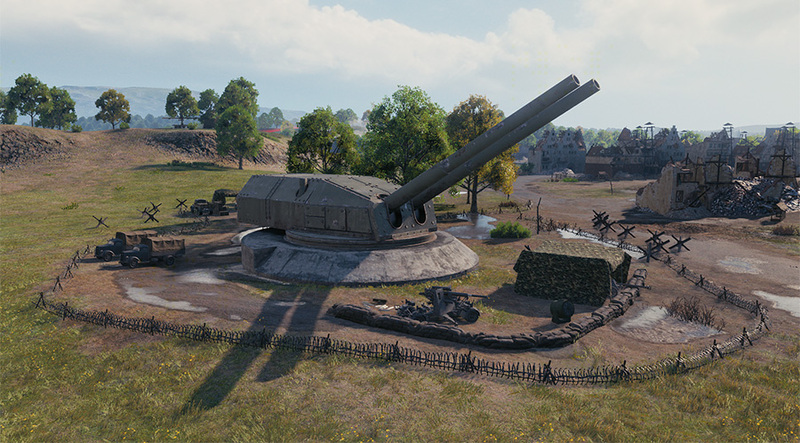 This is due to several key factors that are specifically related to Frontline, including the large map size, large number of objects and vehicles on it, as well as activation of Combat Reserves. Thus, FPS drops and texture-related issues can be expected in some cases. NOTE: The 2019 Season in Frontline is a long-term event with lots of mechanics, balance settings and variable values. During the season, to make your gaming experience more enjoyable, some changes and tweaks are possible, including significant ones. We will inform you in advance and in dedicated articles about any important changes that may appear in Frontline. Stay tuned!